Stopping threats like ransomware, rogue employees and physical data breaches requires a wide range of solutions. Throwing money at the problems and hoping to earn a return on investment simply won’t cut it anymore. Cyber Risk and Assurance (CRA) has never been more integral to enterprise security given the ever-evolving vulnerabilities surrounding data protection. Corporations are increasingly disconnected at a time where a comprehensive overview of digital environments is all but critical to maintaining compliance and avoid falling victim to a cyber-attack. 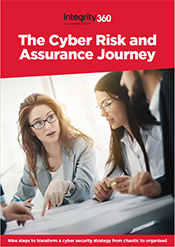 In our guide, we outline the differences between chaotic and structured cyber security strategies and detail the nine steps that can help an enterprise improve its risk posture.